What student—or teacher—can resist the chance to experiment with Velocity Radar Guns, Running Parachutes, Super Solar Racer Cars, and more? The 30 experiments in Using Physical Science Gadgets and Gizmos, Grades 3–5, let your elementary school students explore a variety of phenomena involved with speed, friction and air resistance, gravity, air pressure, electricity, electric circuits, magnetism, and energy. 1. To improve your students’ thinking skills and problem-solving abilities. 2. To get easy-to-perform experiments that engage students in the topic. 3. To make your physics lessons waaaaay more cool. The phenomenon-based learning (PBL) approach used by the authors—two Finnish teachers and a U.S. professor—is as educational as the experiments are attention-grabbing. Instead of putting the theory before the application, PBL encourages students to first experience how the gadgets work and then grow curious enough to find out why. Working in groups, students engage in the activities not as a task to be completed but as exploration and discovery using curiosity-piquing devices and doohickeys. The idea is to motivate young scientists to go beyond simply memorizing science facts. 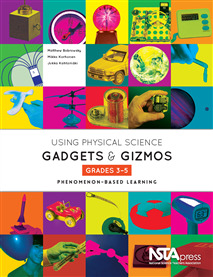 Using Physical Science Gadgets and Gizmos can help them learn broader concepts, useful thinking skills, and science and engineering practices (as defined by the Next Generation Science Standards). And—thanks to those radar guns and race cars—both your students and you will have some serious fun.